The Chiefs were missing both starting safeties for the final practice ahead of their preseason opener with Eric Berry getting a planned day off and Daniel Sorensen leaving with a knee injury. KANSAS CITY, Mo. — The Chiefs were missing both starting safeties for the final practice ahead of their preseason opener with Eric Berry getting a planned day off and Daniel Sorensen leaving with a knee injury. Chiefs coach Andy Reid is being cautious with Berry after the star safety missed nearly all of last season with a torn Achilles tendon. The extent of Sorensen’s injury was still being evaluated. There is little depth behind the starters, especially with rookie Armani Watts missing part of camp with an injury. He got first-team reps Tuesday alongside Eric Murray. 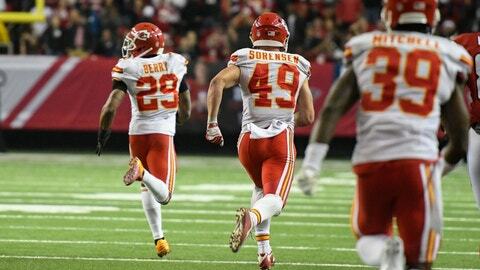 The Chiefs play their preseason opener against Houston on Thursday night at Arrowhead Stadium.